As a future teacher of English as a foreign language, you need to give your students informed instruction in English pronunciation, spelling, vocabulary, and grammar; but language teaching, at the more advanced levels in particular, is also concerned with idiomatic language use, such as collocations and formulaic language, or strategies that match a given communicative situation, e.g. pragmatic knowledge about how to establish and maintain social relationships exchanging messages in a specific socio-cultural environment (like e.g. inviting or apologizing). English has become the lingua franca, the unrivalled instrument of international communication in science, business, aviation, technology, the internet, pop culture etc. across national borders. This has the advantage that your students will already be familiar with a number of English words and phrases and will probably bring with them some motivation to learn the language, and be it initially only to understand the lyrics of their favourite pop song. However, the development of World English and the fact that there are now more non-native than native speakers has also led to an enormous diversification of English, or rather, the emergence of many Englishes which are studied by linguists around the world. It is obvious that foreign language teaching needs to account for this variation and place English in its global context. 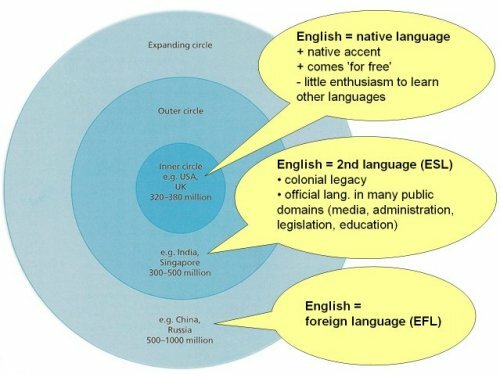 What is "standard English" and who qualifies as a native speaker? What is the standard you should teach, and what linguistic forms represent "real" present-day English, both in speaking and writing? What teaching materials are the right ones for your students? Do (prescriptive) grammar books always describe "correct" usage, or is it necessary to develop strategies for verifying their claims? What is "(in)correct" usage and who is to decide? Such questions are related to two fundamental, opposing views: the prescriptive view of language, which is (unfortunately) still the dominant attitude towards language in the traditional English classroom, and the descriptive approach to language that accounts for the ways language varies and how it is used in social and regional contexts, a view which lies at the heart of contemporary linguistics. the 'locus' of Foreign Language Teaching (FLT, "Fremdsprachendidaktik") within "Fachdidaktik"